Naples is the capital of the Italian region Campania and the third-largest municipality in Italy after Rome and Milan. Get in touch with nature at Vesuvio and Cimitero delle Fontanelle. Step off the beaten path and head to Gesu Nuovo Church and Cloister of Santa Chiara. Next up on the itinerary: steep yourself in history at Gli Scavi Archeologici di Pompei, take an in-depth tour of Galleria Borbonica, examine the collection at National Archaeological Museum of Naples, and explore the ancient world of Ruins of Herculaneum. Baden-Baden, Germany to Naples is an approximately 13-hour flight. You can also drive. Expect a bit warmer evenings in Naples when traveling from Baden-Baden in April, with lows around 13°C. Finish up your sightseeing early on the 16th (Mon) so you can catch the ferry to Capri. Visiting Marina Piccola and Monte Solaro will get you outdoors. Step off the beaten path and head to Villa San Michele and Capri Sea Service. Next up on the itinerary: take a memorable drive along Via Krupp, tour the water at your own pace with Capri Rent Boats, see the interesting displays at Rubino Sergio, and steep yourself in history at Villa Jovis. You can ride a ferry from Naples to Capri in an hour. 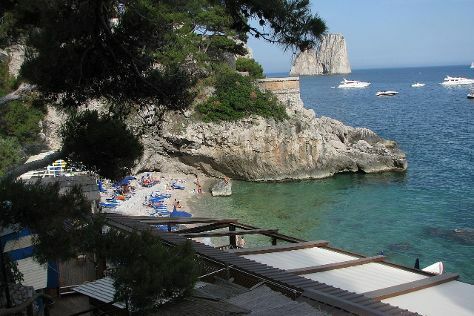 In April, daytime highs in Capri are 22°C, while nighttime lows are 15°C. Finish up your sightseeing early on the 18th (Wed) so you can travel to Forio. Kick off your visit on the 19th (Thu): take in the architecture and atmosphere at Chiesa del Soccorso, witness a stunning natural landmark at Baia di Sorgeto, and then steep yourself in history at Sant'Angelo (Serrara Fontana). On your second day here, get a new perspective on things with West Coast Boat Rentals. Getting from Capri to Forio by combination of ferry and bus takes about 1.5 hours. In April in Forio, expect temperatures between 22°C during the day and 15°C at night. On the 20th (Fri), wrap the sightseeing up by early afternoon so you can travel to Matera. Start off your visit on the 21st (Sat): don't miss a visit to Palombaro Lungo, view the masterpieces at Massimo Casiello - Tornitura Artistica del Legno, contemplate in the serene atmosphere at Church of Santa Maria de Idris, then get to know the fascinating history of Sassi di Matera, then take in the spiritual surroundings of Cattedrale di Matera, and finally explore the ancient world of Cripta del Peccato Originale. On the 22nd (Sun), you'll have a packed day of sightseeing: don't miss a visit to FAI - Casa Noha, then explore the fascinating underground world of Casa Grotta di Vico Solitario, and then contemplate the long history of Parco delle Chiese Rupestri di Matera. You can do a combination of car and ferry from Forio to Matera in 4.5 hours. Alternatively, you can do a combination of ferry and train; or do a combination of ferry and bus. Traveling from Forio in April, plan for little chillier nights in Matera, with lows around 9°C. Finish up your sightseeing early on the 22nd (Sun) so you can travel back home.